Hearty White Sliced Bread is an excellent source of fiber and appropriate for a low protein, low sodium and low phosphorous diet. Ingredients: gluten free wheat** starch, water, palm fat, psyllium seed husks (vegetable fiber), rice syrup, cellulose, gluten-free wheat** fiber, rice starch, guar gum, modified cellulose, dextrose, yeast, carob seed flour, apple extract, maltodextrin, natural (tomato) and artificial flavors. Store in a cool, dry place out of direct sunlight . 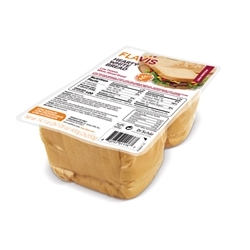 Once opened, store in an airtight container and consume within 2-3 days .